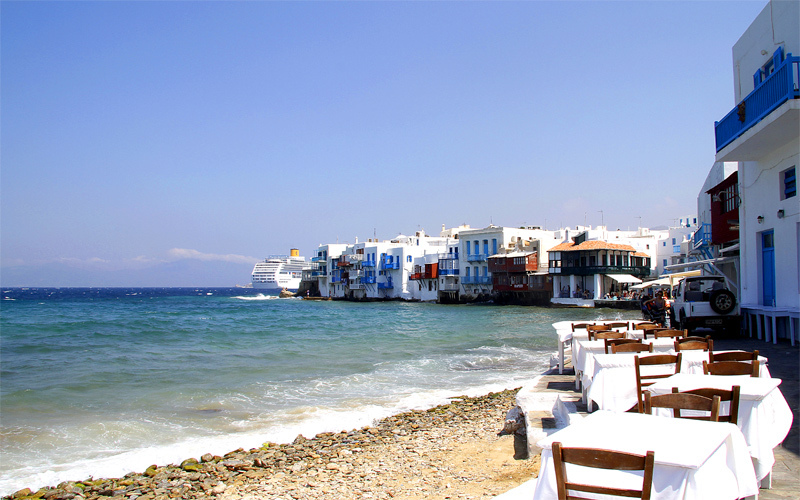 Located in the northern part of the Cyclades, Andros is one of the most beautiful and frequented islands in the Aegean. The traditional Chora, with the whitewashed houses, elegant mansions and paves alleys, and Batsi are its main tourist destinations, offering plenty of accommodation options, from hotel rooms to stylish studios, and other facilities. Apart from its picturesque settlements, Andros is also distinguished for the stunning beaches, like Agios Petros, Batsi and Chrissi Ammos, and well-organized shores, such as Kipri and Ormos. Most beaches are ideal for windsurfing and other water sports, as they are affected by strong winds. In Andros visitors will also find several interesting museums and galleries, for example the Museum of Modern Art. 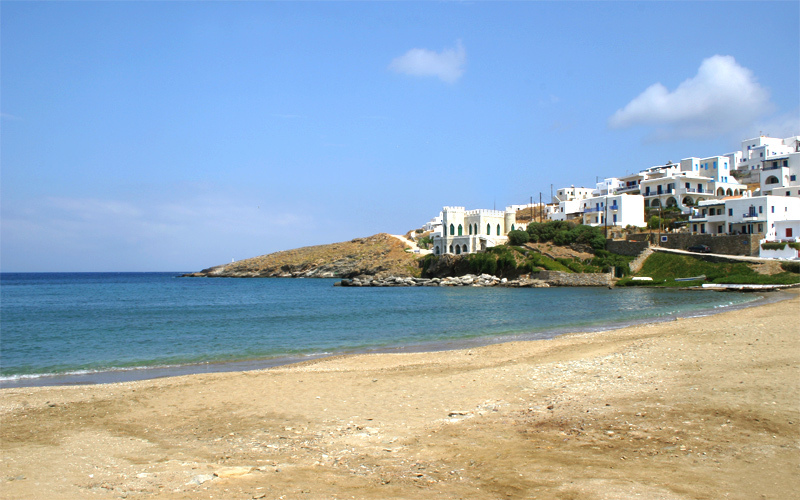 Andros is quickly and easily reached by ferry from Athens, as it is only a two hours ferry ride from Rafina Port. Due to its close proximity to Athens, it is an ideal base to explore nearby locations. Island hopping from Andros may include the incredible islands of Tinos, Mykonos and Kythnos. For those who seek relaxation and meditation, island hopping from Andros to Tinos is the perfect deal, as there are daily ferries in summer. 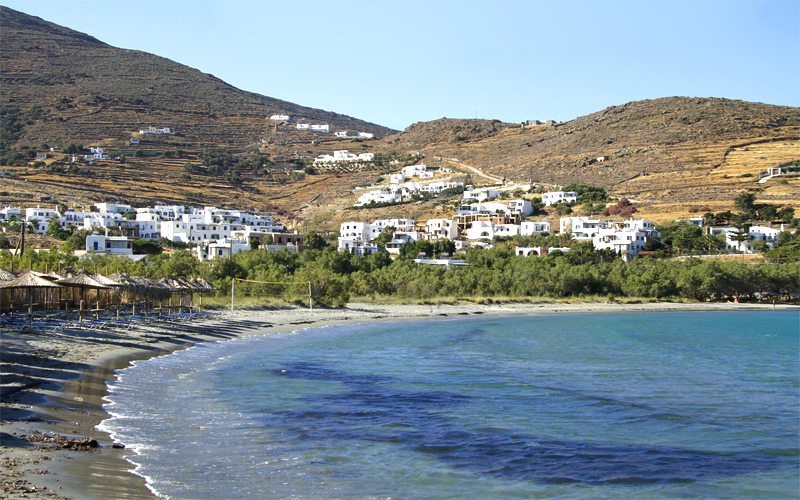 Tinos is also situated in the northern Cyclades and constitutes a peaceful, family destination. A lot of hospitable family studios in nice spots provide modern amenities and easy access to beautiful golden beaches, such as Agios Ioannis Porto. Tinos stands out for the scenic Chora with the impressive Church of Panagia Evangelistria, which is actually considered to be miraculous and receives thousands of pilgrims every year, and the marble-ornamented traditional villages, like Pyrgos, that present a great tradition in marble sculpting. All across the countryside of the island several Venetian dovecotes are also dotted. Another very popular destination for island hopping from Andros, with ferries available all year round, is the party island of Mykonos in the centre of the Aegean Sea. Renowned for its windmills, the wild nightlife, gorgeous beaches and cosmopolitan atmosphere, Mykonos offers something for all ages and types. There are quiet romantic spots to enjoy the marvelous sunset, like Little Venice, while there are also exciting beaches, such as Super Paradise and Paradise, to party all night and day long. Mykonos villages are traditional, in Cycladic style, but the main settlement, Mykonos Town has its own unique architecture inspired from Medieval times. The town is perfect for an evening walk and a relaxing drink at the many bars and cafes. A more alternative island hopping from Andros is the mountainous island of Kythnos, which belongs to the western part of the Cyclades. It is accessible with ferries from Andros only in high season, from middle July until the end of August. Kythnos is a magnificent little island offering wild beautiful scenery, picturesque architecture and unspoilt, wonderful beaches. Don’t miss the chance to drive around the island and visit its most popular traditional villages, Chora and Driopida, with beautiful stone houses and paved streets, and amazing private coves. They are ideal for relaxation. For more organized facilities, Loutra is a famous tourist beach resort, while Kolona is the island’s most stunning beach.